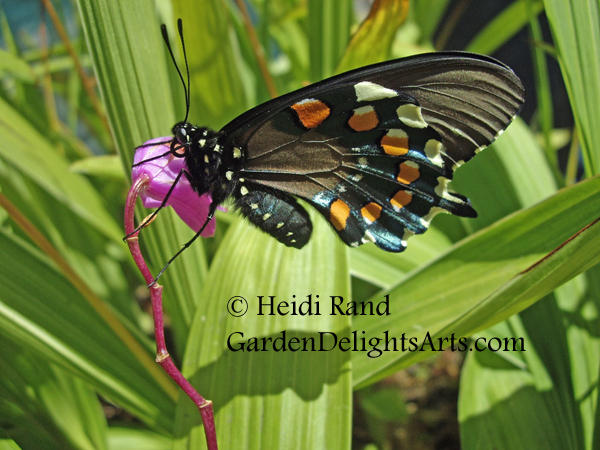 Have you ever seen a Pipevine Swallowtail butterfly (Battus philenor)? 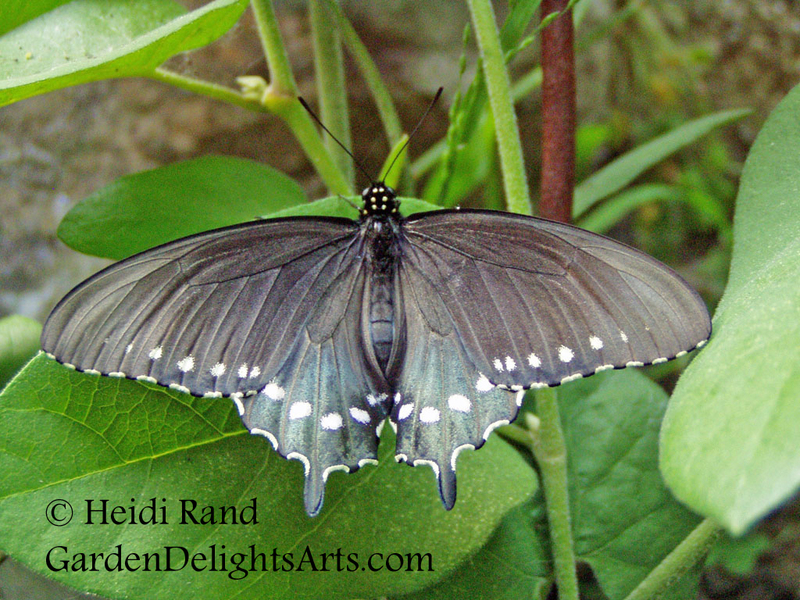 You might not have known what it was called, but I bet you never forgot the incredible sight of a black-winged butterfly. Their underwings are black with spots of orange, cream, and blue. 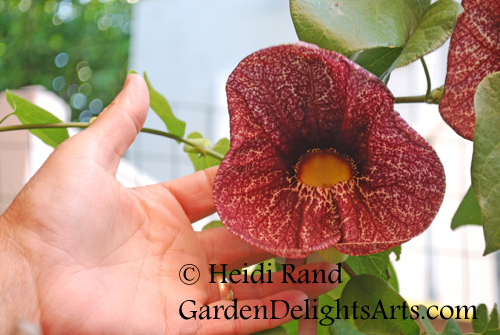 Earlier this year in my Pipevine Dreams post I wrote about the dramatic butterfly and its host plant, the Pipevine (Aristolochia), also known as Dutchman’s Pipe. Well, George discovered an amazing development in the garden this morning. 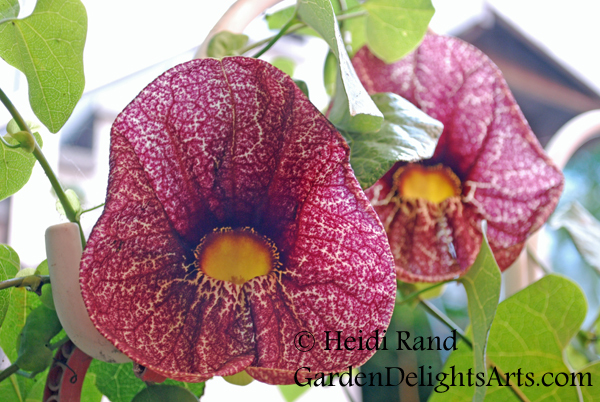 A hybrid pipevine which he planted along our side fence just bloomed. And we’re not talking slightly different pipes, we’re talking dramatic, four- to five-inch flowers! 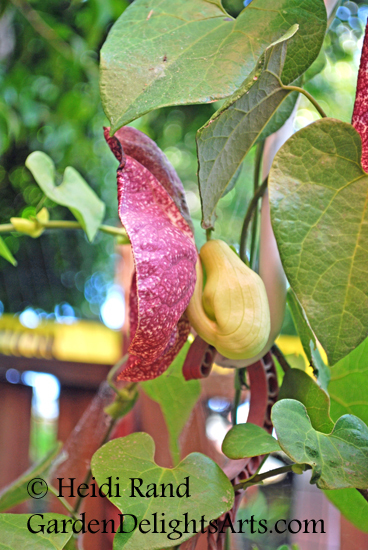 Taa-daa– a flowering Aristolochia durior x A. elegans. 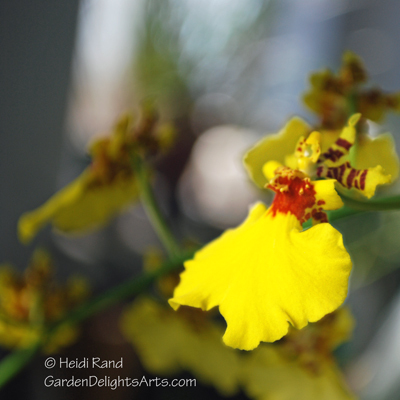 The colors are stunning ,with the broad flowers a deep maroon speckled with white, and the throats gleaming intense yellow tinged with orange-red. 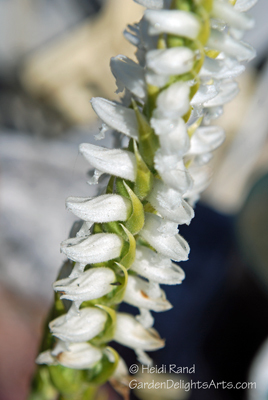 Here you can see the large pipe behind the flower. This shot shows you how large the flowers are. George got the starter vine at the University of California Botanical Garden. They’re having their Fall Plant sale on September 30th, and although I don’t know whether they have any of these right now, they always have amazing plants for sale. 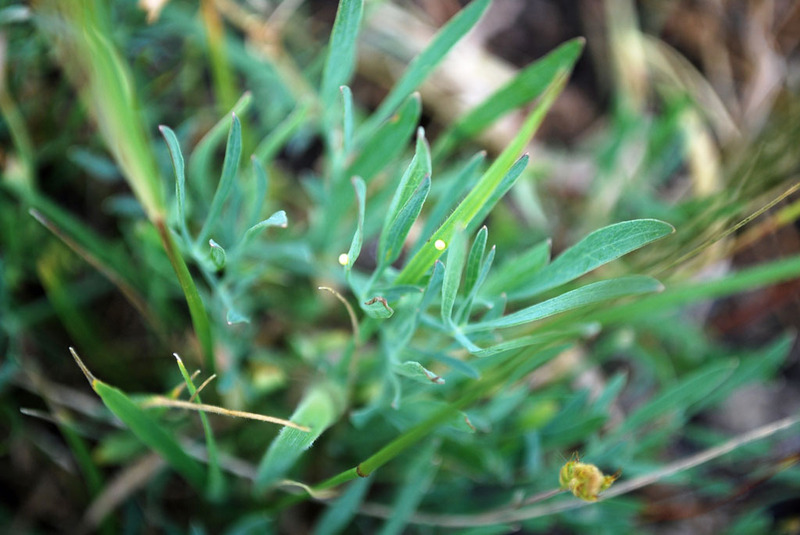 What’s special in your garden this week? Any bird, butterflies, or blooms? 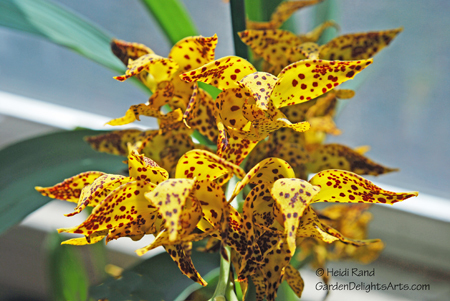 What’s blooming in your garden this week? It’s a lily extravaganza in ours. Just opened: this stargazer lily. 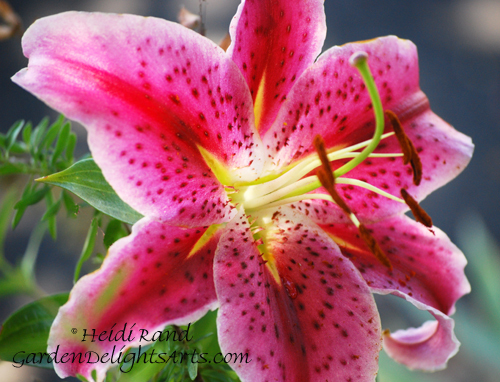 Stargazers, along with their stunning beauty and impressive size, also smell heavenly. 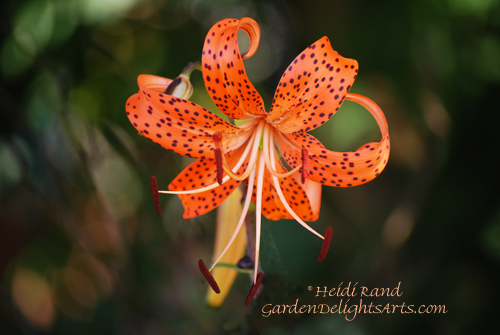 And just feet away in the garden, the glowing orange and brown-freckled Tiger lily (Lilium tigrinum), smaller than the Stargazer but just as gorgeous, opened this morning. George grew this one from a bulb. George says I’ve been taking too many photos of hummingbirds (is such a thing possible?) 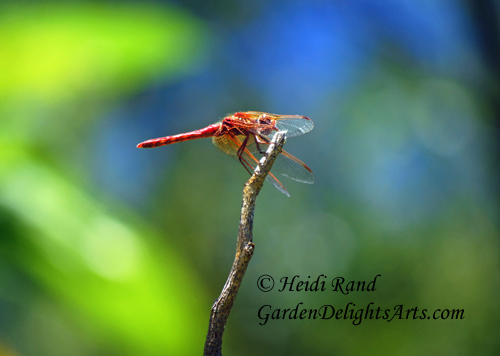 so I was happy to get some shots of this Cardinal Meadowhawk Dragonfly resting on a stick in our pond. Dragonflies are much easier to photograph than hummingbirds or butterflies in the wild, because they rest often, rather than fluttering from flower to flower and flying away. I’ve noticed that when dragonflies visit our pond they find a surface to light on, and although they zip away, they quickly return over and over to the same spot. This is one of my closeup photos of a Cardinal Meadowhawk. 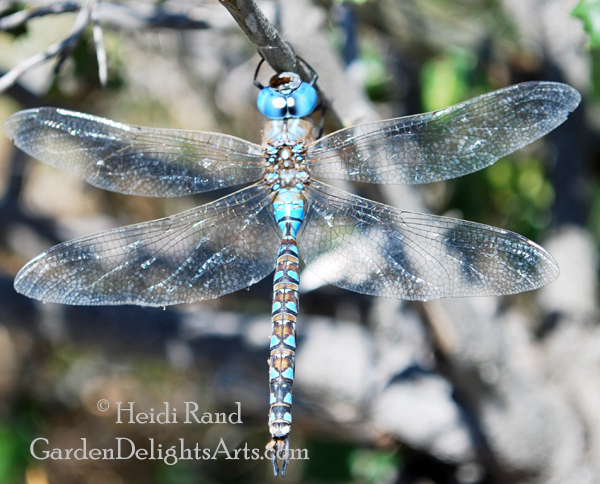 I took this photo of an amazing Blue-eyed Darner dragonfly (Aeshna multicolor) during the Pinole Artisan Plein Air paintout last month. 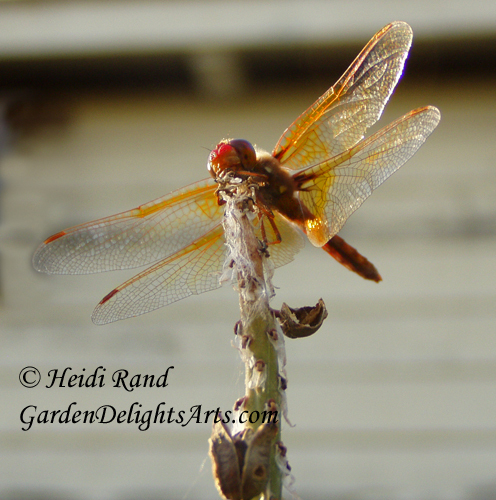 This is my blog post about the paintout and the photo collage that I made using another of my photos of the dragonfly. Other than the Cardinal Meadowhawks, we get tons of these Damselflies in our garden at this time of year. 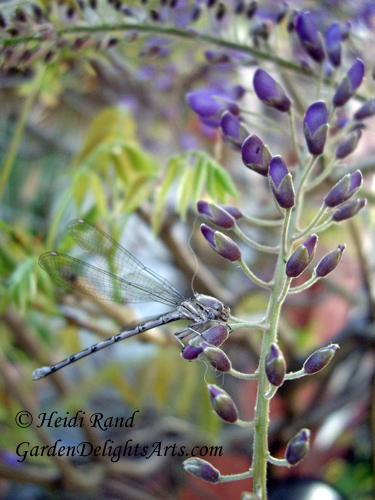 Damselflies are much smaller than most dragonflies, and this one perched easily on a tiny wisteria flower bud.